The world encyclopedia selected the Egyptian Composer, Mohammed Rahim, on its list of top 10 professional composers worldwide. The criteria of selection recognized those composers whose influence exceeded their domestic locations and whose work got translated into different languages over the past years. Mohammed Rahim, born in December 1979, is considered a phenomenal artist. He started composing before he was even twenty years old working with famous singers as the Egyptian legend signer Amro Diab . He then unleashed his talent and composed for most famous singers in the Arab World such as Warda, Asala, Sherine Abdel Wahab, Elissa, Hussine ElJasmi, Mohammed Hamaki, Tamer Hosney, Samir Saied, Nancy Ajram, and many others. Mohamed Rahim achieved many awards such as the “Mohamed Abdul Wahab Award” as best Composer in the Arab World. He was also honored in Paris after he was granted the Golden Membership of “La Sacem”; the French Committee for Composers. La Sacem is considered on the most reputable entities for composers across the globe. Mr. Rahim was also a member of the “Cairo Festival” jury for the Arabic Song. 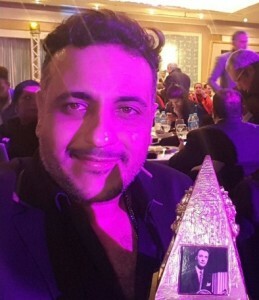 Rahim; in celebration of this latest achievement, published a picture showing his name on the encyclopedia page while offering the award to his fans in Egypt and world-wide.